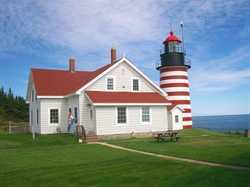 by Ronald Pesha, West Quoddy Head Light Keepers Assoc., Inc. It stands tall and straight, despite its advanced age, beaconing safety to generations of anxious mariners. Ancient volcanic basalt, black and craggy, defile the entrance to Passamaquoddy Bay. Early navigators petitioned for protection from the treacherous scarred precipice as they entered the tidal bore maelstrom of the Lubec Narrows. Then as now knowing people in power provides clout. Revolutionary War hero Col. John Allan lived on Eastport’s Moose Island in retirement. And patriot Hopley Yeaton, native of New Hampshire and appointed by President Washington as the first officer of the Revenue Cutter Service, came to remote Eastport and Lubec during an era of all-pervasive smuggling. 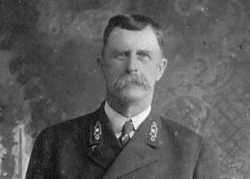 As the Revenue Cutter Service, the maritime law enforcement arm of the Treasury Department, morphed into the U. S. Coast Guard, Yeaton later became known as the "Father of the Coast Guard." Yeaton, friend and companion to Allan, retired in 1798 to his North Lubec farm. By July, 1808 the timber tower and a keeper’s house were complete though the exact date of first illumination is lost to history. But wood rots. Salt spray and dominating fog wreaked severe deterioration within twenty years. A second lighthouse of rubble masonry took over in 1831, the hastily built tower soon leaking badly, its lime mortar soft and unsafe. The romanticized image here, derived from an 1837 Maine geology study, situates the tower down the ramparts, though a 2001 archaeological search located the foundation on the level top of the cliffs, set back from the edge. High technology of the 1850s, a great era of lighthouse construction dictated a new solid brick tower, equipped with the most modern apparatus. 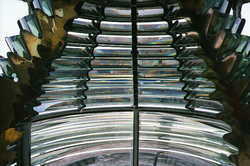 Congress ordered, from France, a cast iron stairway and pedestal, a copper dome, and the ultimate in illumination, a Fresnel lens. Named for the French physicist and mathematician August Fresnel (fray-NEL), the 62-inch high third order cylindrical lens efficiently focuses light toward the horizon up to 360 degrees. Manufactured in many small segments, its two ton heft of glass and iron framework was transported across the sea and up the tower. Assembled in place in 1857, the latest lamp using “modern” proprietary fuel oil shone brighter than ever. And that lens is still there. Electrified in 1932 according to an exhibit at the West Quoddy Visitor prepared by the Maine State Museum, a standard 1000-watt theatrical type bulb powers the lantern as of 2009. 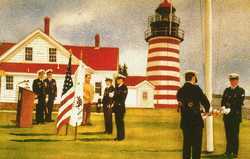 A mechanized base holds two bulbs which automatically pivots 180 degrees should one burn out, simultaneously telemetering a status signal to Coast Guard headquarters in Southwest Harbor, Maine. A lighthouse is more than light. Ships must be warned in conditions of fog, a ubiquitous phenomenon at West Quoddy. In early days a vessel beset fired a cannon, thus requesting the West Quoddy keeper for similar acknowledgment. Soon a bell replaced the cannon. 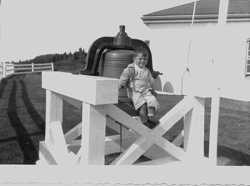 Three different bells ranging from 240 to 1500 pounds plus a 14-foot triangular affair like a giant old time rural dinner bell were used sequentially. Hand operation (with a $60 per year bonus to the keeper) and subsequent clockwork operation remain unsuccessful. The sound failed to propagate well through the fog. With erection of the 1857 tower came a new keeper’s house and a brick utility shed, originally storing heating coal. 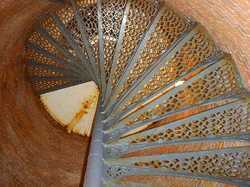 Steam powered the 19th Century, and eventually fog signals at lighthouses. That shed first housed a hot-air horn, then in 1868 a steam whistle, standard aural alarm of the era from factories to locomotives. By 1887 an enlarged building housed machinery for two whistles. Those whistles show on the roof, each adjacent to a stack. According to West Quoddy Head Light Station history, “during a particularly foggy year, two 10-inch whistles were in operation 1,402 hours, consuming 128,085 pounds of coal.” By the turn of the century, the Canadian-invented Diaphone sounded safety through the soup. 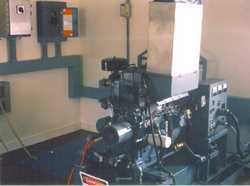 Its slotted cylinder pumped an effective low-pitch aural signal. Eventually the modern electrically-powered foghorn became standard equipment at lighthouses. Not an easy life those early days, roadless dense forest isolating the early lightkeepers from the small farming population in North Lubec. The 1899 renovation of the keepers’ house created a duplex with ground floor extension at the rear for two kitchens. Amenities for family living encouraged extended tours of duty. The old boiler building now houses emergency automatic-start generators and telemetry equipment. Imposing Ephraim “Effie” Johnson, appointed assistant in 1899, became head keeper in 1905. Roots laid in Lubec, he served to 1930 then retired up on South Lubec Road. Eugene Larrabee occupied the post from 1930 to 1939; his children and Johnson’s walked together to school. Starting under Larrabee in 1934, Howard “Bob” Gray raised a large family in the keepers’ house, documenting their years with many snapshots. Gray also survived the transition as the old Lighthouse Service merged with the U. S. Coast Guard in 1939. Gray served West Quoddy until 1952, retiring only when unexpected injury mandated. Ligthouses and all other Aids to Navigation remain under jurisdiction of the Coast Guard, now part of the Department of Homeland Security. One by one U. S. lighthouses moved from manned to automated. The transition came inevitably to West Quoddy, on June 30, 1988. 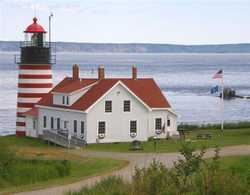 The lands, the structures, and the tower up to the lantern became property of the State of Maine, Bureau of Parks and Lands, coveniently adjacent to Quoddy head State park. 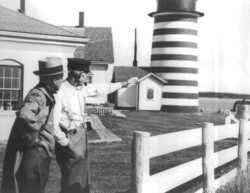 In the old days of the Lighthouse Service, and even during Coast Guard aegis from 1939, keepers hosted the occasional tourists up the tower. 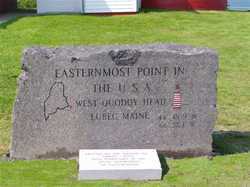 No longer true in this automated era with tens of thousands finding way to Western Quoddy Head annually, they photograph their families adjacent to the tower and the granite Easternmost Point marker. Those in summer enter the Visitor Center, long desired by the State of Maine but left to genesis of a small, local Lubec non-profit organization to create and operate. Opening in 2002, the guest register typically shows 17,000 to 20,000 tourists each year.